The HAPIfork is an electronic fork that monitors how quickly you consume food. 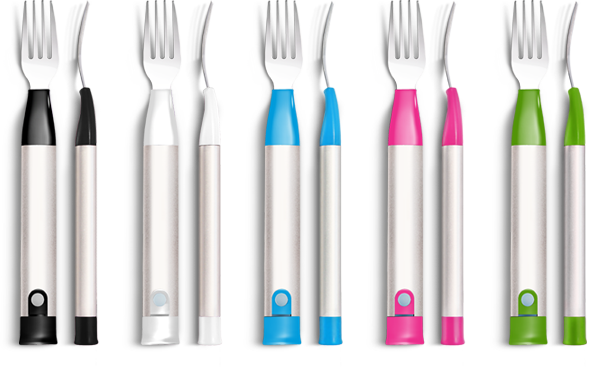 It looks like a larger version of any regular fork, but it buzzes if you’re eating more quickly than the optimal amount of bites at a time. The idea is for you to become more aware of your consumption, enabling you to stick to your diet and help prevent digestive issues. The logic behind the creation of the HAPIfork is clear – there are literally thousands of articles explaining that eating slowly can help you feel full faster and lose weight. But is a vibrating fork the best option? According to the reviews on Amazon, it’s not quite there yet. So, I say pocket the $79 you would’ve spent on the HAPIfork and use these techniques to be more mindful while eating instead. 1. Drink a glass of water before you eat. This may not necessarily help with the pace of your food consumption, but it will help you to feel full faster. Studies show that people who drink water before a meal tend to eat less, and the best part is that water is free. 2. Turn off the TV. If you’re eating meals while distracted, it takes longer before you realize you’re full, causing you to overeat. Simply focusing your attention on your meal can help you to reap the benefits of mindful eating. Bonus points for concentrating on the food’s flavor. 3. Use a larger fork. So the HAPIfork may be onto something with this one, but research has linked using a bigger fork to eating less. Why? Scientists say it has to do with the size of the bites you take, which probably take longer to chew, giving you more time to feel full while eating. Like this article? Follow this blog and then check out the cup that can keep you hydrated.